Can Facebook Videos Compete With YouTube? The new improvements in the way Facebook handles videos is showing some huge gains in popularity. In early 2015 Facebook allowed users to embed Facebook videos on other sites and began implementing video ads to Facebook users. But can the social networking site compete with a video giant such as Google's YouTube? If it was any other social networking site, probably not. But Facebook has made strides in areas that many others failed, and with around 1.4 billion users, any venture into new territory can be viewed as a threat to the current leaders. However, YouTube has around 1.3 billion users, and since all of its users are either posting or viewing videos, it will be a hard market for Facebook to break into. One way Facebook could possibly compete is due to the fact that many Facebook users post videos, such as music, gaming, and comedic videos to their page. However, at this time, many of those videos posted to Facebook timelines are YouTube videos. 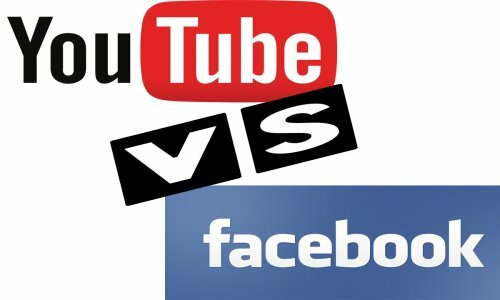 Facebook will have to provide the same variety of videos as YouTube in order to sway YouTube users away from YouTube and toward Facebook. A recent survey conducted by Ampere Analysis has found that Facebook users are increasingly turning to Facebook videos over YouTube videos. While YouTube boasts three trillion views per month, survey estimates have placed Facebook at gaining on YouTube to around two trillion views per month. While Facebook certainly won't be catching up to YouTube any time soon, the growth and increased number of views are both positive outlooks for Facebook's video service. But with the increase in Facebook videos, this poses a new problem for people who like to download videos. The vast majority of all video downloaders are directed at YouTube, as YouTube has been the market leader for years. But with Facebook stepping up the video game, this means that video downloader developers must step up also, and ensure that their programs are compatible with Facebook videos. This is why the 4k Video Downloader is the top choice of many users who download video from Facebook. You see, the 4K Video Downloader has been compatible with Facebook since the beginning, so they already have a huge base of users. Those users give input to the developers, which has resulted in a video downloader that works, not only with YouTube, but also with Facebook and many other video-sharing sites. While most video downloaders are still incompatible with Facebook videos, there are a few that are trying to jump on the bandwagon now. You need to be careful if you try out any of those video downloaders, as they are new to the game, and you may be downloading software that is buggy, or may even have some type of malware installed. That's one thing you don't have to worry about with the 4K Video Downloader. The program is guaranteed to be 100% free of all viruses, spyware, malware, or any other type of malicious code. And since 4K has been compatible with Facebook videos from the start, all the bugs are already worked out. You get a nice, shiny, clean program that works. What more can you ask for?